When I started this site in 1997, I thought it was important to add a For Sale section because Pilots collectibles were so hard to find. Since then, it�s become much easier, thanks to near-universal Internet access (something that was still far in the future during �97) and to Major League Baseball�s licensing efforts. Steve Cox�s fantastic documentary, The Seattle Pilots: Short Flight Into History, features interviews with players and team staff, tons of photos, film footage and also prominently features the Pilots� 2009 reunion. It�s available through Amazon and there�s more information on Steve�s Web site. Danrick Enterprises has four Pilots radio broadcasts for sale on cassette: April 8, 1969 (Angels); May 13, 1969 (Yankees); September 2, 1969 (Angels) and September 22, 1969 (Yankees). You can hear clips from two of those games and more in Radio section of this site. The Pilots live on in at least two video games: Old Time Baseball from Stormfront Studios and All-Star Baseball 2003 from the now-defunct Acclaim Entertainment. Stormfront's game includes every major league team from 1871 to 1981 and there are also 3-D models of 16 classic stadiums, including old Comiskey Park (the only one in the game where the Pilots actually played). I haven't played Acclaim's game, but I'm told that it was very well done, except that the lettering on the Pilots' uniforms was the wrong color. If you know of any other video games featuring the Pilots, please let me know. Screen-captures would be much appreciated, too! You can get an autographed copy of Ball Four: the Final Pitch, personalized for you through Jim Bouton's Web site. This is the final update of the baseball classic that tells Jim's story as a pitcher for the Pilots. It was named one of the Top 100 books of the 20th Century. Other books about, or prominently featuring, the Pilots can be found here. The question I'm asked most frequently is where to buy a Pilots cap. A better question is which version to buy, because a lot of the reproductions are inaccurate. On the left is the accurate cap design (I couldn't get my camera to accurately capture the color--it's actually quite close the other cap). 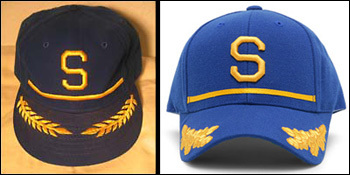 The cap on the right is the most common of the inaccurate caps--note that the design on the bill is radically different, the band above the will is sewn on rather than embroidered and the "S" is close but not quite right. There are also several new cap designs available..
Mitchell & Ness has sold reproduction Pilots jerseys and warm-up jackets for years, but they�re sometimes out of stock, so you may have to do a little digging to find one. Authenticated game-worn jerseys sometimes go on sale via on-line auction houses, but expect to pay $1,500 or more, depending on the player and condition of the jersey. There are about a half-dozen different Pilots t-shirt and sweatshirt designs, all readily available on-line for $20 to $50, but as far as I know, no one is making reproductions of the original t-shirts. .
eBay usually has dozens of Pilots items up for bid, while Dave�s Vintage Cards is a good source of trading cards at reasonable prices. The only place in Seattle that I know of that regularly carries Pilots items is Gasoline Alley Antiques.